I hope you enjoy my stories of spanking (and female masturbation), they are all illustrated with photos taken by myself in my studio…. I have had four books published and it is lovely to see my books on shop shelves and libraries. Royalties are wonderful and it makes my efforts worthwhile. The experience of working with publishers was interesting and they taught me a lot. I can go back to my stories at any time and add to them, my vampire can have a new bottom to bite whenever I feel for example. I can put the naughtiest of photos in! I spend ages writing a story and building characters, but a publisher gets it and…put that chapter here, delete that one, we don’t like her, make him younger, her older, do it from this viewpoint, her viewpoint, make it victorian, more spanking, less spanking…. aaaaaaaaaagh!!! Stop stop! Just leave my stories alone! Here is a nice little story, all about lesbian love and spanking across Victorian Class divides. A Managerie of Naughty Girls – a series of short stories. 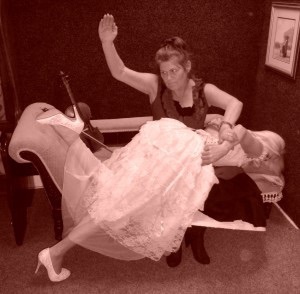 For those of you interested in vintage spanking photos, then try this. I have used a lot from my collection. It is the follow on from above. Pingback: Charlotte « Grumpy old fart!! !